for one or 2 yeares [? ]; or as long as I will. 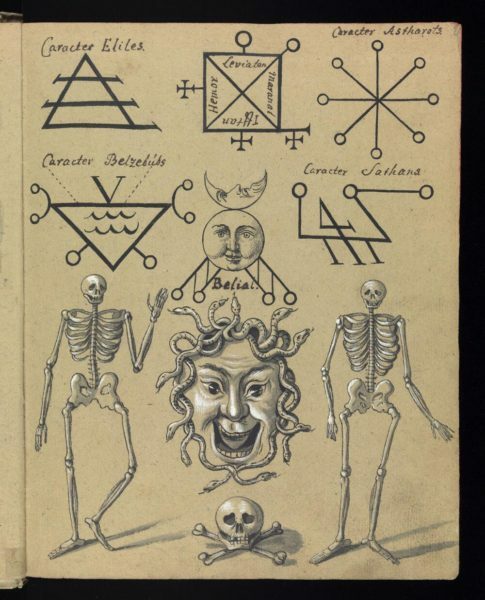 Recently, my attention was brought to a fantastic book from the Wellcome Library: the Compendium rarissimum totius Artis Magicae sistematisatae per celeberrimos Artis hujus Magistros [A Very Rare Compendium of the Whole Art of Magic, Systematised by the Most Famous Masters of this Art]. The familiar symbol at the top right? That’s for Astaroth, a Duke of Hell. It doesn’t match up with the older sixteenth- and seventeenth-century traditions, though. The book claims to be from 1057, but is actually from c.1775. 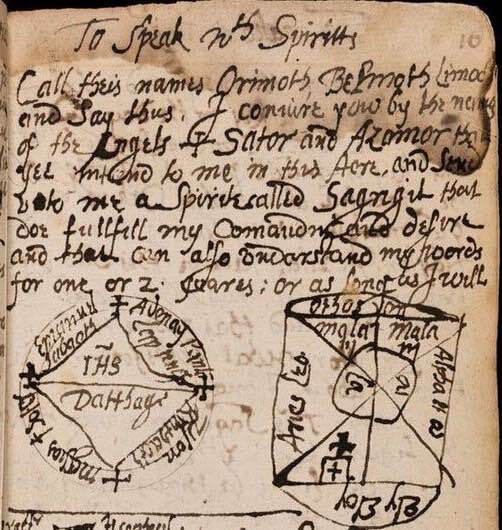 This sort of pseudo-scientific magic and demonology is a creation of the Renaissance and an emphasis on rationality and systematisation; in fact, the very next page has symbols for the elements, demonstrating that up to the Enlightenment, there wasn’t much difference between science, magic and demonology. But by the time this book appeared, it was already out of date. The great witch trials were long over, and the author’s dating his work back to 1057 is a bit of pseudo-medieval sensationalism. The first page tells the prospective reader: “Noli me tangere [Don’t touch me]”, which to me sounds more like an advertisement than any real warning (and would to any self-respecting PC too!). Certainly, the lavish illustration makes the whole thing look more like a scandalous coffee-table book than anything intending to be practical. A sharp eye can spot mistakes even in forbidden documents. Aleksander Temkin managed to spot an error in my Cult of the Possessed and for that I thank him! The main reason this page is done as blog (other than my frustration on writing a web page) is the ability to comment on things. So please, always remember to give comment when you think you have something to say. This page is for the whole community. Not just for my ego-boost. Download the updated version of Cult of the Possessed HERE as a pdf. I would also like to remind you that the Daily Empire’s Tumblr blog is active and updated almost on daily basis. Check out inspirational art for your WFRP games and submit things you like HERE.